Before I begin making the trip back east back tomorrow morning, I want to share a new favorite terrestrial pattern I picked up on my travels while fishing in MT. The pattern is called Arrick’s Flying Ant and it’s been a favorite ant pattern among both resident anglers and guides for years. I recall my brother talking about this pattern over 6 years ago, but I became reacquainted with this pattern while fishing the Madison River two days ago. While I believe good tactics trump patterns, this fly saved the day while fishing near the $3 Bridge area with Charles Boinske, Cline Hickok, and Blue Ribbon Fly Shop Guide Drew Mentzer. After a good morning nymphing up a few fish, the crew wanted to get some dry fly action in. With little to no signs of any hatches, Drew suggested that if we wanted to fish dry flies then we should try one of his “go to” ant patterns-Arricks’s Two Tone Flying Ant. The originator of the pattern is Arrick Swanson, owner of Arrick’s Fly Shop in West Yellowstone MT. Long story short-this pattern outperformed any dry fly pattern I had previously used that day. The quality I like about the pattern is it’s visible, easy to tie, and floats like cork. As with some of my favorite trout patterns, this fly (i.e. this is the two tone variation) has contrasting colors built into the fly. Other colors options Arrick uses are straight black and straight cinnamon. Below is short but very informative YouTube video showing how Arrick ties this simple but deadly ant pattern. Whether you tie your own flies or prefer to buy them from Arrick’s Fly Shop, I would humbly suggest adding a few to your dry fly arsenal this fall. This is Arrick’s Two Tone Variation. Blue Ribbon Guide Drew Mentzer holds up a quality brown trout taken on an Arrick’s Ant by Charles Boinske. No, this is not about your bladder and its relation to fishing. Instead, it’s a fishing bum’s opinion on where some of the best fish hold during peak hatch season. Here in central Pennsylvania, some of our peak hatches occur from late April through early June. The largest trout in the stream get that way by taking up the best feeding lie in the stream. During this time, I’ve observed that some of the best fish take feeding position at the head (i.e. top part) of most runs and riffles. This may mean a twenty-inch fish holding in just three or four inches of water. Why? One possible explanation is that the majority of our insects live in heavily riffled sections, and the head of such runs or riffles acts a food funnel for the trout. This can be especially important during hatches when insects dislodge from stream bottom as they migrate toward the surface to hatch. In these situations, the head of a run concentrates a lot of food within a small area. These fish are more prone to spook because they are holding in a skinny water, where predators have easier access, so take extra caution when approaching such water. There’s a reason why a quality fish will continuously fight a strong current while holding in only inches of water: there’s abundance of food. The return on investment is worth the potential danger. Recently I fished a popular stretch of a central-Pennsylvania spring creek. Both tan caddisflies and sulfurs were hatching in the early afternoon, and after catching a couple trout, I decided to sit down along a high bank to see if I could find a few trout to sight-fish to. At the top of a run was a 16-to-17-inch brown trout (a large trout for that stretch), in three inches of water. Seeing trout hold in skinny water isn’t necessarily unusual on this stream; what was interesting was the frequency with which this fish was feeding. Every four or five seconds, this fish was sliding right or left picking off drifting nymphs. This went on for five minutes before I couldn’t resist and made a cast to fish. The trout immediately pulled left and inhaled my nymph the moment it came in contact with the water. The lesson here is to be ready for the strike to occur the moment the fly lands, especially when you’re fishing the head of a run or riffle. Things will happen fast, often faster than the angler can react to. This is why I prefer to use a tight-line nymphing rig, where you are in contact the moment the nymphs land on the water. You might think you’ve hit bottom because you’re using a heavy nymph in skinning water, but my limited experience that tells me it’s likely a trout instantly jumping on a nymph. While this feeding position can take place throughout the year on my home waters, springtime is when I see it occur with the most consistently. However, I urge you to experiment “hitting the head” on your home waters during peak hatch season. You may be surprised to see some of the actively feeding big fish take position at the head. Hitting the Head is a good approach during peak insect activity when trout position themselves at the head of the runs to intercept drifting insects. But with all things fly fishing, I’m a tinkerer. Much of my enjoyment comes from experimenting with tactics and equipment and trying to better understand why some tools and tactics work better than others. I, too, occasionally get stuck in a rut and continue to use older methods and tools that worked for me in the past, but I like to experiment, believing that I can always get a little better with my technique and better match my tools with the task at hand. For instance, I have tinkered quite a bit with sighter material, a colored section of monofilament placed within the leader to aid in strike detection. Before I go any further, let me make it clear that any material on the market today will work. What I’m going to do is advocate using a softer monofilament sighter when drifting lighter weight nymph rigs. By drifting, I’m referring to using a lightweight nymphing rig, which essentially drifts in the water column by itself (without the angler needing to pull it down stream) while the angler stays ahead of the drift with the rod tip. You’re leading the drift-not pulling it. I feel one of the biggest misconceptions about tight-line nymphing is that you need to keep a “tight line” for strike detection by placing heavy weights on the nymphing rig, dragging it through the drift, and looking to feel the strike. Often a heavily weighted rig under tension is a good idea (see Tightline-Nymphing Tips: When in Doubt, Drag ‘Em), but there are situations where drifting a nymph is more effective than dragging. And a softer monofilament sighter may aid in detecting strikes while drifting light weight rigs. Softer sighter material can be stretched easily, which makes it quite sensitive. For example, while excellent fishing opportunities can be had year round in central Pennsylvania, April through mid-June is peak hatch season—when most anglers travel to our area to chase the bugs. When trout are looking upward for food, drifting a lighter-weight nymph rig may produce better results. A trout strike is going to be softer with such a light rig, so what I’m looking for is a sighter material that allows me to see (not feel) these softer strikes. Enter softer sighter material. During the drift, softer monofilament will twitch nervously–going in and out of tension. When the twitching stops, which indicates the rig has encountered resistance, it’s time to set the hook. You can stretch this softer material with a light pull and see how it flexes like a rubber band; it’s this quality that offers an advantage when seeing soft strikes on light weigh rigs. This lesson has proven successful for catching species other than trout, as well. Boiling Orvis sighter material for six minutes produces the right softness. I have a quarter-acre pond on my property, which holds small perch and blue gill. Every day, my kids and I spend about an hour fishing with Tenkara rods and micro perch jigs (i.e. lightly weighted) on a level nymphing leader. At first our leaders were 6 feet of level 8-pound Gold Stren ( stiffer sighter material) attached to a 4-foot section of 5X tippet. But I would often see a perch inhale my jig with a strike that barely registered anything on the Gold Stren sighter material. Stren is highly visible but not limp. My kids were catching fish, but I wanted to see if a softer material could allow them to see the strike better. So I switched from using Gold Stren to using a 6-foot level section of soft sighter material, and the difference was immediate. Both my kids and I were able to see the soft perch takes by simply waiting for the nervous twitch to stop, and our catch rates increased. I’ve experimented with my clients over the last two years by changing sighter material throughout the day while pursuing trout, and I’ve found that most anglers are quicker to register strikes when fishing lighter weight nymphing rigs by watching for the softer sighter to tighten. Remember that you’re more likely to see the strike rather than feel it when fishing with lighter weight rigs. You can create a softer sighter material by boiling short sections of sighter material in pot for 5 or 6 minutes. Recently, I’ve been boiling 30-inch sections of Orvis Tactical Sighter material for 6 minutes. This drastically softens the material and creates a rubber-band-like stretch, which I feel is helpful for drifting light nymph rigs. Then I tie in the 30-inch sighter section into my favorite nymphing leader for drifting lighter nymph rigs. So give it a shot, and happy drifting! Softer Sighter Material will tighten and then relax during the drift…like a nervous twitch. A reason to set the hook is when the the twitching stops. I enjoy participating in the consumer fly-fishing show circuit every year. Presenting information is fun and I like meeting new people, but I really love sitting in on lectures by other anglers. As I get older, I’m more enthusiastic to listen to seasoned anglers share their knowledge and experiences. Often I learn new tactics, while at other times I’m simply reminded of lessons I may have forgotten. For example, I recently attended the VA FLY Fishing and Wine Festival and caught a few minute of Jason Randall’s presentation on “Where to Find Trout.” Jason is a veterinarian by trade, and he brings a simplified scientific approach to his other passion, fly fishing. He recently wrote a fantastic book, Nymph Fishing Masters, a collection of tips and information he obtained while fishing with several knowledgeable nymph anglers across the country. One of the tips he discussed in his presentation is blind striking while nymph fishing, a tactic in which the angler sets the hook in a likely spot, despite not seeing any strike (e.g. an indicator or sighter hesitating or going under). Instead of watching for confirmation, the angler is simply anticipating a strike. Some anglers may call this a “sixth sense,” but experienced fly fishers who know the water well may refer to this as an educated guess: the laws of probability are too great not to set the hook despite not seeing any reason to set the hook. Jason mentioned picking up this tip from Joe Humphreys. Incidentally, when I was in my late teens, one of my first lessons while fishing with Joe was about blind-striking. (Then this lesson reemerged 10 years later when another mentor of mine, 1989 World Fly Fishing Champion Wladyslaw “Vladi” Trzebunia, demonstrated this tactic while fishing near the Arctic Circle in Finland.) 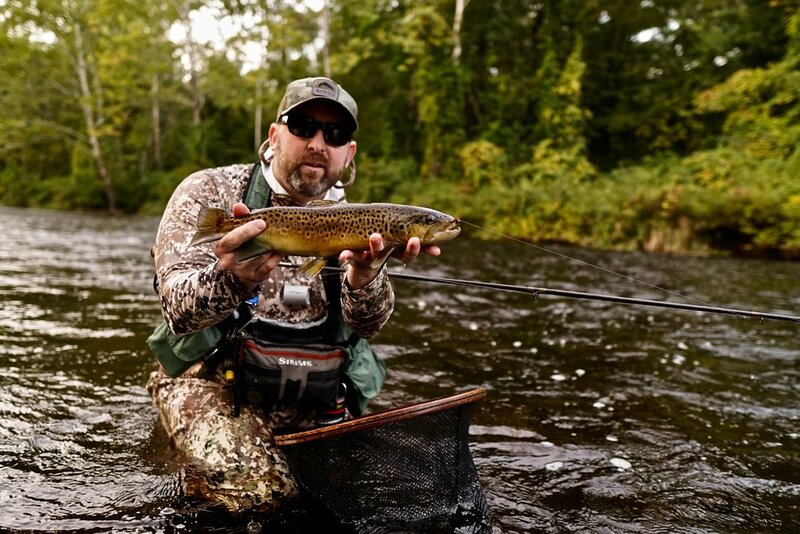 While watching Joe on my local waters, I noticed him presenting his nymphs to the head of a fast-moving riffle, drifting for two to three seconds, and then immediately lifting to set the hook to begin the next presentation. If there was no fish, his blind strike would unroll behind him, acting as a backcast. However, he would often hook a trout without ever seeing his line or leader hesitate. When I asked him if he saw the fish strike, he was honest and said he did not. He explained that trout holding in pocket water, near shallow banks, and at the top of riffles are often aggressively feeding, which means there’s a tendency for them to jump on a nymph the moment it comes into sight. This quick reaction often translates into a missed strike, as the angler is in the process of adding slack into the presentation to allow the nymphs to drop to stream bottom. Slack is often necessary to give the nymphing rig enough wiggle room to drop to the strike zone. So Joe would purposely blind-strike during the first and second presentation to a specific area. If he didn’t hook anything on the first two blind-striking presentations, then he would let the third (and all following presentations) drift farther downstream until the nymphs reached the end of the presentation or until he saw a strike. Again, he would blind strike the first 1-2 presentations in a specific lie then let the proceeding drifts occur until the end of the drift or until he noticed a strike. The blind strikes were simply part of his system. This blind-striking approach can be used in all water types, but I’ve found it to be more effective in the water types mentioned above, where trout will jump on your presentation the moment the nymphs enter the water. Jason Randall refers to these water types as “high confidence lies.” So anytime you’re fishing these high confidence lies, don’t forget to blind strike. It’s an important tactic that even the best anglers I know use. So thanks for the reminder, Jason Randall. I’ll make sure to incorporate blind-striking on my next outing in those high confidence lies, and I hope you do, as well You’ll be surprised how well it works. Joe Humphreys gave me my first lesson in blind striking. Often he’ll cast to the top of the run, count to 3 and blind strike. Leave No Fly Behind and Avoid "The Hanging Tree." Recently I’ve been amazed by the number of flies and rigs that anglers have left hanging on streamside trees and bushes. On one stretch of water that I frequent on a weekly basis, I’ll usually see a number of hanging patterns, so I wade across the stream and cut them free. The flies are in great shape since they’ve only been there for less than seven days (since the last time I waded across and cut them from the same spot). Sure enough, they will be in the same spots the time I show up. And it’s easy to wade across and retrieve the pattern, so I can’t understand why these patterns are left to hang. I’m not suggesting to risk your life to retrieve flies, but please do so if it’s possible without risks. This mangled limb was only several feet off the bank of The Madison River…even my 7 year old son could have retrieved these flies without the risk of falling in. "Becoming a great nymph angler"
My mentor Joe Humphreys will often ask anglers, “what is the difference between a great nymph angler and an okay one?” Then he’ll quickly answer his own question with the following answer, “one split shot”. What he means by this statement is, getting your nymphs to the strike zone is key to nymphing success. Good pattern selection is helpful but it doesn’t matter how good your pattern is if you aren’t presenting it at the fish’s feeding level. I was reminded of this lesson a few days ago while fishing a mountain stream near Yellowstone National Park with several friends. In this case, all it took was switching from a 7/64” brass bead head to a 7/64” tungsten bead to begin catching fish. 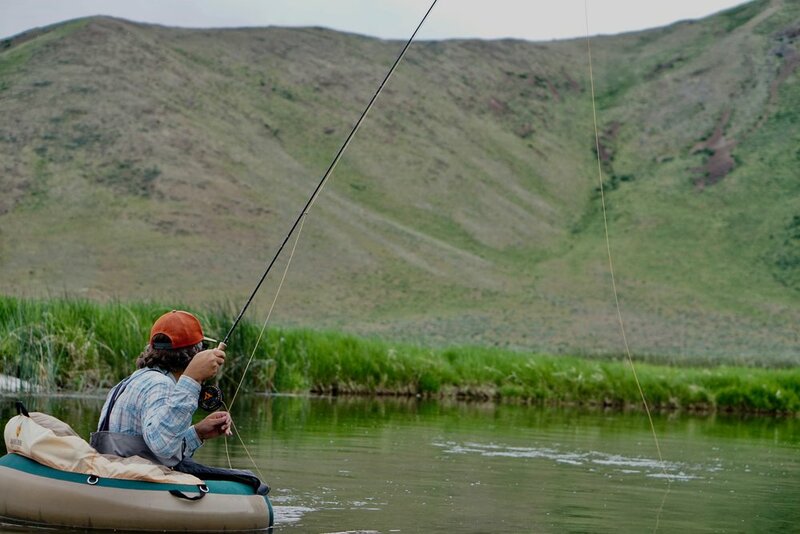 Although known for being easy to fish, small mountain streams will offer situations when trout are not willing to move higher in the water column to eat. Trout are not overly intelligent, but their sharp survival instincts have allowed them to live for millions of years. As it relates to their feeding habits, there are times during the day or during a specific season when trout will actively move laterally to feed on emerging nymphs. These are the few days of the year when it doesn’t seem to matter how shallow or deep your presentation is-trout are going to move to eat it. However, the angler needs to fine tune their weighted rig for the other 95% percent of the time, when trout are feeding horizontally-not vertically. I’m not talking about the exact precision a carpenter uses to make fine English furniture, but we need to be in the ballgame when it comes to presenting nymphs. This brings me back to fishing with two friends on a mountain stream near Yellowstone National Park. A typical high gradient mountain stream, this body of water has deep pockets and averages two feet in length, which meant the drift were short. Several near freezing nights made for challenging morning fishing. With basically no dry fly action in the morning, we needed to nymph in order to catch fish so we went with a dry dropper rig with the hopes of switching to dry flies once the trout began to show interest in our suspender dry fly. I was optimistic that my presentation didn’t need to be rolling near stream bottom so I attached a #14 brass bead head (7/64” to be exact) nymph and dropped it 20 inches off a #12 bulked up X Caddis. By “bulked up” I mean tying in a liberal amount of deer hair to make the dry fly more buoyant and capable to suspending heavier nymphs. This exact rig worked great the day before in a very similar scenario along a neighboring body of water, which contained similar water. The only difference was a small hatch of drakes and olives had fish eating higher in the water column and on the surface. My nymphs didn’t need to riding deep since trout were looking up for food and the brass bead head nymph had just enough weight to get into the strike zone. With no signs of hatching insects and after going 15 minutes without a strike, I switched to the exact same nymph pattern but this one had a 7/64” slotted tungsten bead. NOTE: I now exclusively use slotted tungsten beads rather than the traditionally drilled beads. This way I can easily distinguish the tungsten beads from the brass beads by locating the slotted section on the bead. After the first cast with the tungsten nymph, the dry fly suspender drifted significantly slower in the pocket and I immediately began catching fish…just like with a simple weight adjustment. Then I switched back to the brass bead head to see if the additional weight was the factor. And again, I went fishless in the next five minutes with the brass bead, then began catching fish the moment I switched back to a tungsten nymph. It’s not hard science but it was enough proof for me that a small difference in weight can make a difference while nymphing. While fishing a small mountain stream, I feel pattern choice isn’t all that important. What was important was that my rig was riding deeper in the column, which made it easier for lethargic fish to eat. And this is why I’ll often tie one size nymph (e.g. #14 pheasant tail) but I’ll that same size pattern with vary sizes of brass and tungsten beads. Although you can use split shot to add weight, I try to avoid adding split shot to dry dropper rigs as I find myself getting tangles when casting (not lobbing) the rig to a target. When your nymphing rig isn’t producing-make a weight change. Such a weight adjustment will only take a minute to make but can add hours of enjoyment to your fishing. This is just another example of why I enjoy fly fishing-it’s an activity that requires troubleshooting. If you want to go from being an “okay” nympher to being a “great” one, maybe the only thing that’s stopping you is a slotted tungsten bead. Charles Boinske fishing a MT Mountain stream. A heavier slotted tungsten bead was the only weight adjustment needed to begin catching fish.